Horror fanatics are about to get a lot more New Line films through the year 2022. 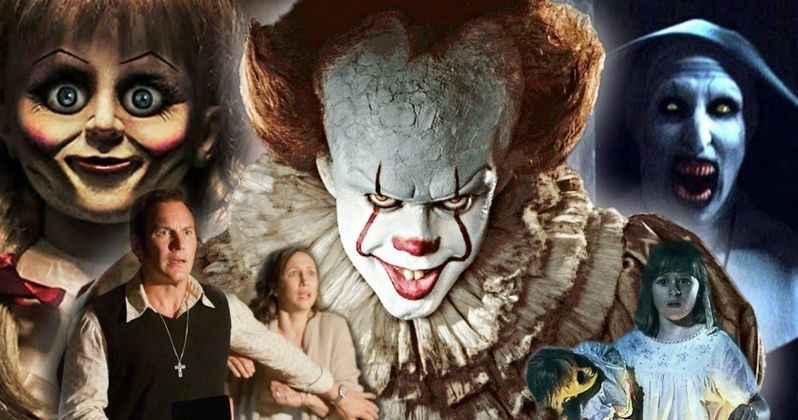 After the success of Andres Muschietti's big screen adaptation of Stephen King's IT and the popularity of The Conjuring series, New Line has announced that they have two more projects that will fill in the post-Labor Day slot for September 10th, 2021 and September 9th, 2022. IT 2 releases in 2019 with a new Conjuring movie hitting theaters in 2020. It has not been confirmed, but many are speculating that James Wan and his team are preparing some ideas from Atomic Monster for the untitled slots. The Nun recently set a box office record for The Conjuring Universe after earning over $336.1 million at the box office since its debut at the beginning of September. Before that, The Conjuring 2 held the record at $320.4 million, but all of the films contained in the Universe have earned upwards of $250 million at the worldwide box office, which makes the decision to throw four more years of horror movies during the post-Labor Day releases a no-brainer. While The Conjuring franchise has been incredibly successful, last year's IT knocked it out of the park. The reimagining of one of Stephen King's most beloved books earned over $700.3 million at the worldwide box office, making it the highest grossing R-rated Horror movie of all time. Andres Muschietti is hard at work on IT: Chapter 2 right now, and production is expected to wrap shortly. Anticipation for the sequel has been off the charts as fans look forward to seeing how Muschietti and crew tell the second half of the iconic story. It was recently announced that Michael Chaves will be taking over for James Wan on The Conjuring 3, though Wan will remain on board as a producer. It has yet to be confirmed if the 2020 spot will go to the third installment in the series or another spin-off. Horror fans have been waiting for The Crooked Man, which has been on the backburner for quite some time now over at New Line. Regardless, Wan will more than likely have a hand in at least one more of the future horror movie coming out in the next few years. It was also recently revealed that James Wan and New Line are creating a horror competition reality TV series. The currently untitled project will consist of 13 episodes and will be executive produced by Wan and his Atomic Monster production company. Production company Magical Elves, best known for Top Chef and Project Runway, will also produce the series. 13 filmmakers will be chosen by a panel of horror directors, producers, writers, and executives. The filmmakers will be given the challenge of creating the scariest short films that they can, with the winner getting a deal with New Line for a feature-length film. It's not clear when the show will premiere, but one would believe that it would air in time for next Halloween. New Line is definitely cooking up a lot of horror material for the next handful of years. This news was first reported by Deadline.